GRAND RAPIDS, Mich. – SpartanNash is proud to announce the company is the first food distributor in Michigan to sign Migrant Legal Aid’s Fair Food Pledge, affirming the company’s commitment to fair labor practices for the state’s more than 94,000 migrant and seasonal farmworkers and their families. By signing the Michigan Fair Food Pledge, SpartanNash affirmed its commitment to fair labor practices for the state’s more than 94,000 migrant and seasonal farmworkers and their families. The Fair Food Pledge exemplifies SpartanNash’s commitment to corporate responsibility, including the fair treatment of farmworkers. The company is the fifth largest food distributor in the United States. SpartanNash distributes fresh produce from 250 Michigan farms to its 160 corporate-owned stores and 2,100 independent customers. 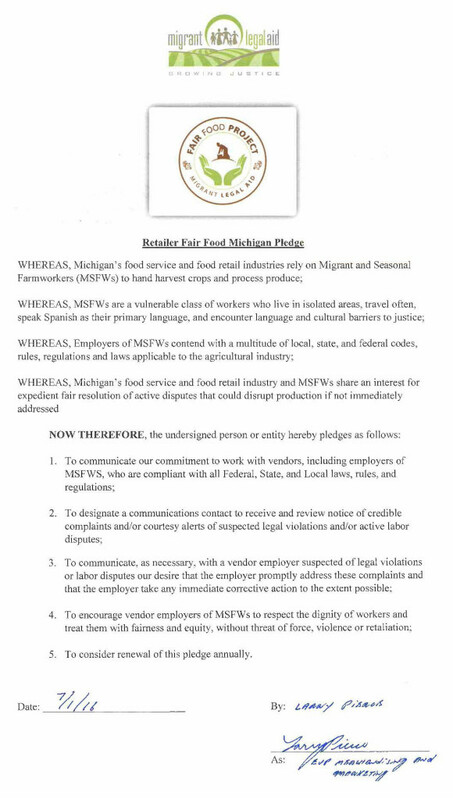 By signing the Michigan Fair Food Pledge, SpartanNash pledges to work in partnership with Migrant Legal Aid when Michigan produce suppliers appear to be in violation of regulations requiring fair treatment and safe working conditions. This includes respecting the dignity of workers, treating them with fairness and equity and providing fair wages, access to bathrooms and drinking water and safe, clean housing. Michigan is the second-most agriculturally diverse state after California. Forty-five Michigan crops are hand harvested by migrant and seasonal farmworkers each year, including blueberries, tart cherries, apples and cucumbers. For more information about SpartanNash’s commitment to corporate responsibility, visit SpartanNash.com/corp-responsibility. In 1973, migrant workers and their families had no voice to stand up for their right to safe housing and working conditions or their right to earn a fair wage. They struggled to maintain basic human dignity, from lack of bathroom facilities, dangers posed by pesticides and discrimination. Because of their poverty, their transitory lifestyle and their language difficulties, they faced barriers to civil legal services. Out of this need, the legal community in Michigan formed Michigan Migrant Legal Assistance Project, also known as Migrant Legal Aid, a non-profit agency.